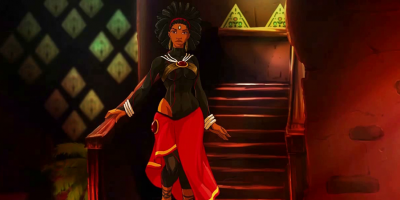 If you’ve been playing video games a long time, parts of Aurion: Legacy of the Kori-Odan will feel very familiar to you. But the parts that are infused with an African sensibility won’t feel familiar at all, and that’s a very good thing. The new release by Kiro’o is clearly a freshman indie effort. Translated from French, the writing doesn’t show the localization polish that Western gamers take as a given, and its storytelling moves at a slower, rougher pace. But Kiro’o has done an impressive job building out an African-inspired sci-fi reality with its own tensions and textures. The fusion of African cultural inspiration and Japanese DBZ tropes gives it a flavor unlike anything else in the video games medium. These moments are the kind of thing that may just be a plot beat in a hero’s narrative journey elsewhere. But they find added resonance in a fictional world created on a continent where refugee crises are horrifyingly familiar. That resonance also shows up in the philosophical jousting that happens when Enzo and crew encounter a boss character named Daruba who accuses the deposed king of Zama of being naive. Daruba also says that the aggression that he and his people wish to visit on Auriona is a direct result of political decisions from other countries. Kiro’o provided save files that span the entire game, and I jumped ahead for the Daruba sequence above. I’m only about five to six hours into Aurion but can already feel the depth of its battle system. The combat here is chunky and challenging, with moves spread out on a two-tiered matrix. The screen can feel cluttered at first, but that initial confusion fades once you figure out what to pay attention to. Successful combos build up energy to let Enzo unlock his more powerful Aurionic attacks. The fights in Aurion may seem to rely mostly on twitch-reflex response, but there’s actually a lot of high-level strategy you’ll need to figure out to power through the challenging boss fights. Learning when to unleash particular moves and which attacks work best against various enemies is a process that constantly grows deeper as you play. Thanks to the poorly translated text, there have been times where I’ve just had to guess at what I’m supposed to be taking away from the dialogue and tool tip text in Aurion. But this has encouraged me to experiment more so I could suss out the game’s particular quirks and rhythms. From what I’ve played so far, Aurion feels like it’s a hefty time investment of 20 hours or more. It’s definitely a whole new kind of video game world that’s worth exploring, crafted in a clear, multidimensional way from real-world folks who don’t get heard from nearly enough in video games.